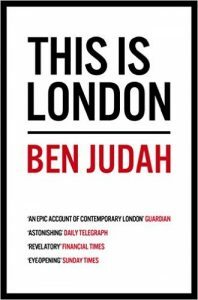 Ben Judah’s This Is London has the subtitle ‘The stories you never hear, the people you never see.’ Although only published earlier this year, even that recent past already feels like another country in the nasty, mean-spirited xenophobia of Brexit Britain. Not that the book is remotely starry eyed about the way immigration has changed the capital. On the contrary, the rich people who feature are the unpleasant rich, Russian oligarchs or Middle East princelings, or, worse, people traffickers. But most of the people he talks to are poor, albeit perhaps a bit less poor than if they had stayed in their home countries. And it isn’t that ‘we’ really don’t see them, because there they are, cleaners, baristas, serving in corner shops, begging on the streets. But the fear of poverty (described so brilliantly by Julia Unwin in her book Why Fight Poverty?) makes it more comfortable to not to pay attention or think about them. To be sure, Ben Judah also goes to parts of the city I’ll never get to, sleeping rough or in a doss house, hanging out in Willesden kebab and gambling shops. A bit of a hierarchy of migrants emerges, Albanians and Romanians at the bottom as the nastiest or most desperate, whom none of the others like. The Polish builders – as all of us ‘native’ Londoners know (I’m a migrant from Manchester) – are on the whole skilled and hard working. They wonder: “why do the English wander into expensive sandwich bars and lose more than one hour’s wage for just one meal deal?” They think the English workers are lazy and stupid. Indeed, there are employers who agree. Interestingly, Polish women can earn more than men because they have better English and cleaners earn more than minimum wage. Interesting because it seems to affect the psyche of Polish men. But there’s also an economics question here: why don’t Polish men work as cleaners for the additional £3 an hour? The book is great reportage and paints a picture of the capital few of its middle class inhabitants will ever see. It was a page-turner, a more or less sympathetic but carefully observant portrait. I don’t think it’s a completely representative picture, though. London is too mixed for the middle class=British-born, white and poor=foreign, black formula to be true any more. Opinion poll and voting evidence seems to suggest the people who live in London are comfortable with how it is. It was the non-urban rest of England that isn’t.